An evaluation of the impacts of live music in care home settings conducted by Live Music Now in partnership with MHA (Methodist Homes), the Orders of St John Care Trust and Winchester University. * Exploration of ways to support care staff to lead music activities, to enhance their caring role and job satisfaction. * Observation of commitment from care staff with a shift from initial reluctance to enthusiasm. * Report of practical findings about the use of percussion and repertoire, and issues of space in care settings. * Identification of how music can support autonomy and self-expression for older people in care. * Consideration of difficulties and challenges that may impact on the success of any music programme in a care setting. 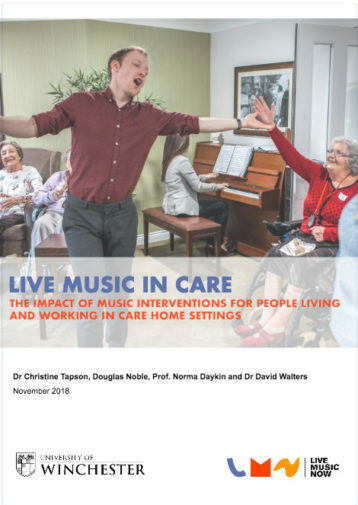 Tapson, C., Noble, D., Daykin, N. and Walters, D. (2018) Live Music in Care: The impact of music interventions for people living and working in care home settings. London: Live Music Now.